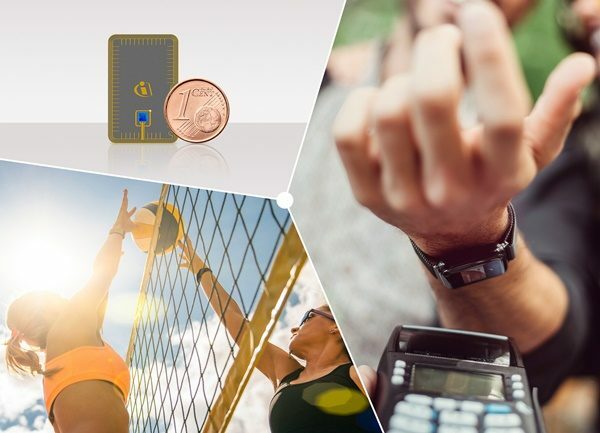 It was never easier to integrate secured payment functionality into fashion accessories: Infineon Technologies AG (FSE: IFX / OTCQX: IFNNY), the global leader for smart card payments, now provides EMV*-based payment solutions for key chains, rings, wristbands or bracelets to name a few. The new SECORA™ Pay W for Smart Payment Accessories (SPA) combines an EMV chip with the card operating system, payment applet as well as the antenna directly on tape. As a turnkey solution it allows card vendors, device manufacturers, financial institutions or event organizers to quickly and cost-efficiently introduce fashion accessories for payment and even access. Most recently, Wirecard, the global provider of digital financial technology, and card vendor exceet Card AG, together with the German online bank comdirect supplied payment accessories based on Infineon’s SECORA Pay W SPA solution. During the German Beach Volleyball Championships 2018, the spectators used their wristbands for making payments at the event. Smart wearable technology is being used in a variety of applications from business computing to healthcare monitoring. The potential of wearable payment devices like smart watches, wrist bands, key chains and fitness trackers is reflected in market research results. ABI Research, for example, expects a booming global market for wearable device shipments – reaching more than 500 million units by 2021 while 20 per cent of these devices are expected to be connected with a payment, transport or access control application. The new SECORA Pay W for Smart Payment Accessories (SPA) is optimized for card manufacturers and Original Equipment Manufacturers. It comes with unique antenna designs that are based on Infineon’s extensive semiconductor and module expertise. Combining a profound understanding of the payment ecosystem as well as expertise in contactless and energy-efficient chip design, Infineon enables fast and secured contactless payment with transaction speeds of 300 milliseconds and below. Infineon’s SECORA Pay solutions portfolio comprises the SECORA Pay S for standard Visa and MasterCard payment cards, SECORA Pay X for applications with extended features such as multi-application, national debit and white label schemes or access management and SECORA Pay W for payment accessories. All SECORA turn-key solutions are pre-certified by Mastercard and Visa and will accelerate the deployment of contactless payment. They are available now in volume quantities.